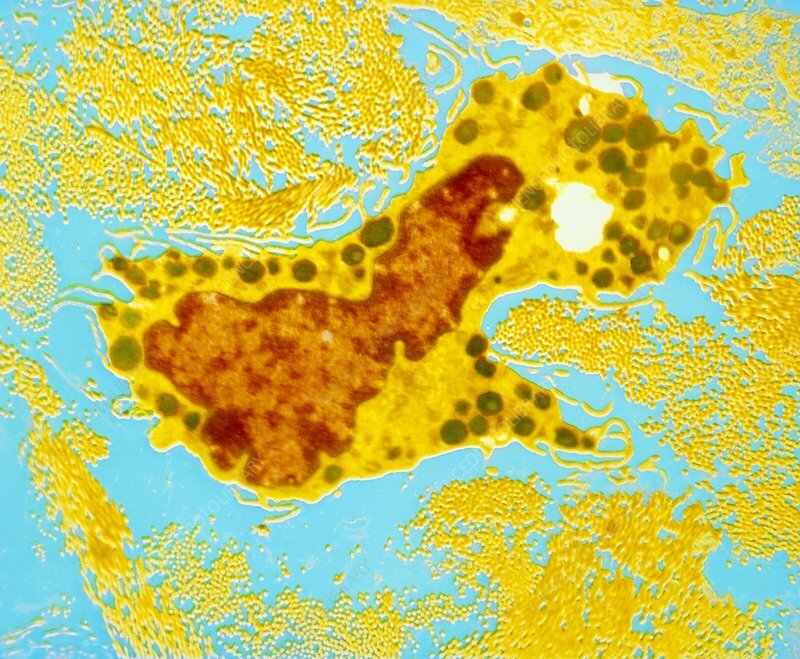 False-colour transmission electron micrograph (TEM) of a human mast cell (mastocyte), found in loose areolar connective tissue surrounding blood vessels, respiratory airways & the peritoneum, & is involved in the secretion of histamine & heparin. The nucleus (brown, irregular) is surrounded by a cytoplasm (yellow) containing granules (black) that are the site of histamine storage. Histamine release involves the fusion of the granule membrane with the mastocyte's plasma membrane (allowing communication of granules with extracellular fluid, when a no. Yellow dots outside cell are collagen fibres. Mag: X 1700 at 35mm, x3400 at 6x7cm size. In addition to histamine & heparin, the mastocyte.